No high-end or dedicated home theater is complete without a video projector. Video projectors are the only way to truly re-create that big-screen experience you get when going to the movies. In addition, you can get a 100-inch screen size with a front projector for less money than a 100-inch flat screen. 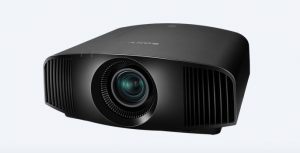 When you are considering a front projector ask yourself five questions: 1. What type of room will your projector be used? 2. What size, shape, and type of screen do you want? 3. What sources do you plan on connecting to your system and how? 4. Do you want a 3D compatible projector? 5. How important is 4K compatibility to you? Talk with the experts in our store. Come in or make an appointment and learn the differences.